Each year about this time, I notice that some of my terrestrial Jewel Orchids (Jewels) are initiating inflorescences. There are about a half dozen of these variegated beauties scattered around the greenhouse. 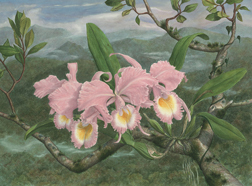 Last year, Orchid magazine featured articles on this diverse orchid group. They do not resemble other orchids in that they are grown for their leaves, not flowers, and are generally terrestrial species. Hybridizers have also begun to create more vigorous hybrids with a variety of different patterned leaves. A few now even have colorful inflorescences. Leaves of Jewel Orchids can be striped, mottled, variegated, or with jewel-like spotting, hence the name. One Jewel orchid has been in collections for years, i.e. Ludisia discolor, but others have only recently been introduced. Ludisia is easy to grow under a variety of conditions, which explains its popularity. Most of the others grow very differently and require special care. Cultural requirements vary greatly since they belong to many different genera and come from all over the world; from tropical to temperate climates. It has taken me many years to figure out how to grow them and I have not been successful with all I have tried. The common cultural attribute for Jewels is that they are almost all low light species and typically grow on the forest floor, which should provide some idea of their preference for light. A few like the Ludisia, creep along the forest floor and put fine roots down into the decomposing leaves, while most tend to grow from a basal stem, below which are thick, tuberous-looking roots, where the orchid stores its energy. The key to growing Jewels is to gain some insight into the habitat from which they came. A species that came to me with a request that I provide identification refused to bloom or even grow well. They were listed as coming from Belize, and I assumed warm climate with constant moisture. My assumption was not correct and they actually came from dry forests on the West Coast of Belize. When I provided a distinct wet and dry period associated with more light, they all flowered. The assumption when they were collected was that they were different species because each one had a different pattern on their leaves, but they were all the same species based on their flowers. All of the “Jewels” that have grown well for me are grown in a porous medium, ProMix HP, with lots of drainage in the bottom of the pot. As the plant gets larger, the depth of medium is increased. Most flower in winter. During the summer, I put all of them under the benches and do not worry about them as they get adequate moisture from dripping pots above. In early December, they are moved into more light. That automatically induces drier conditions and they all begin to flower, although at different times. Jewels that grow well for me here in the South in a greenhouse with no cooling are Stenosarcos speciosa and its hybrid Strs Vanguard, Sarcoglottis screptroitus, and Pelexia laxa. Pelexia laxa is supposed to be a cool growing species, but grows well in my hot conditions, even here in Florida. Hobbyists growing on windowsills may find that a few Jewels are worth trying as they grow under lower light levels and are beautiful year-round.